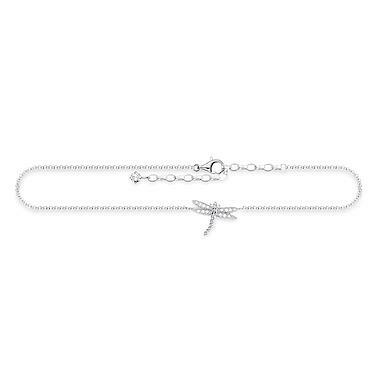 From Thomas Sabo's 'Glam and Soul' collection is this gorgeous Silver CZ Dragonfly Anklet. The collection is designed to reflect feminine elegance through the detail of the jewellery. This Thomas Sabo Silver CZ Dragonfly Anklet features a Sterling Silver delicate chain with a dragonfly design charm in the centre of the chain. The dragonfly gives the anklet a feminine touch and features sparkling Cubic Zirconia stones. This anklet is perfect for the summer season and would be a great piece of jewellery for wearing on holiday. The perfect gift for her! This anklet is crafted from 925 Sterling Silver and features a small CZ stone at the end of the chain near the clasp.